What if you don’t like sour cream? Posiblr substitute? Has anyone made this ahead? Any idea how it would do put together the night before and then heated up??? Love this dip and the first time I made this it turned out awesome. The last two times I made this it separated and I cannot figure out why. Any thoughts? Would this recipe work well with chicken instead? 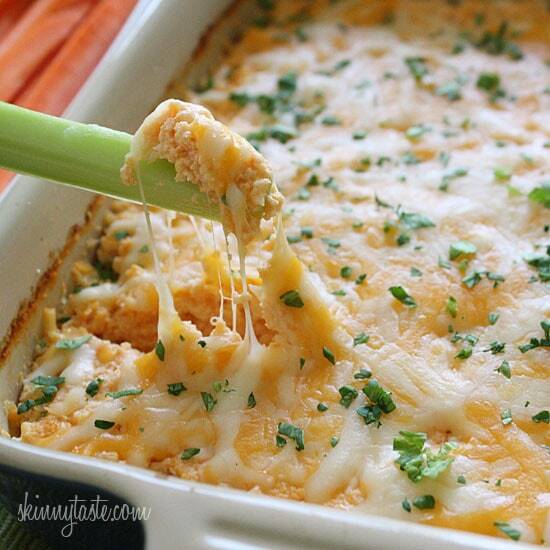 I want to make a buffalo chicken dip for Super Bowl this year but I don’t love blue cheese like your other recipe calls for. How would this taste with chicken? My dip was runny so we changed gears and used it as a "sauce". Perfect buffalo shrimp pasta salad dish. Add hot, cooked whole wheat pasta, fresh tomatoes and fresh spinach for a delicious, still healthy, filling dinner option! YUMMMMMMMMMMMMMMMMMMMMMM! Made this for the Super Bowl. It was a huge hit!! Thank you!! I'm going to be making for NYE. Wondering why the blue cheese/ranch dressing , that is typically used in these type of recipes, was omitted. Concerned that the sour cream may not give enough flavor. Any reason for the SC vs. dressing? Anyone try without SC? If so, what did you use? what was the revision? I made it exactly and mine was soupy as well. I followed the directions to the tee and made the version without yogurt, but its very runny. Is it supposed to be thick? Suggestions? I'm going to retest this and see if I can fix it. 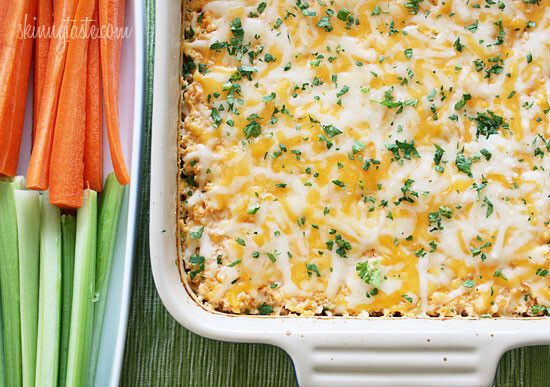 I just made this dip & it turned out fabulous! I forgot the vinegar, but it's still very yummy. WOW! 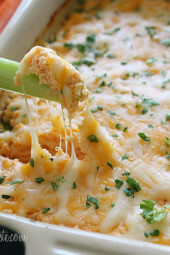 I love your buffalo chicken dip. I love shrimp. I am SURE this will be a hit. I usually do mine in the crock. I just like the creaminess better. Like someone else said it's the way the cheese is out of the oven. just my personal thing. Wondering about using those teensie precooked shrimps and not dicing them. This looks so yummy! But I wouldn't be able to handle all the "hotness" on my tummy. Is there an alternative to the hot sauce that would make it still yummy? Mmm this looks so good! I am going to have to try this! I made this dip for my Super Bowl party and it was a huge success! Everyone loved it! Mine turned out a little soupy also but it did firm up a bit. Didn't matter to anyone anyway, they ate it up! We were even dunking the little pigs-in-a-blanket in them. Awesome dish!! I loved this dip…could have just eaten it with a spoon.. although it did turn out a little soupy. I made it for a Super Bowl party and it was delicious. I would definitely make it again. Mine was very soupy! Added extra cheese to see if that would help. It tasted better once it cooled and became a little less watery. I made this yesterday for the Superbowl. It was super spicy but still yummy. Our came out runny. Shrimp was not too moist. I'm not sure what happened. However, Franks Hot Sauce ROCKS! Love it and am so glad to know about it now. Bummer, I printed the old recipe before you made the revision. It was super runny the flavor was really good. just not very appetizing as it got cold it became much thicker, I would also decrease the hot sauce to 1/4 c, the hot sauce masked the flavor of the shrimp. Ours was runny too. Tasty, but not the consistency shown in the pics. Our shrimp weren't 100% thawed (though I drained excess liquid) and I doubled the recipe, so who knows. Agree, made this for the Super Bowl and it came out completely liquidy, even after squeezing water out of the shrimp. Mixed this up earlier today and just baked it. It's totally liquid. Not sure what happened, but there is no way it could be a dip. I even made sure to get as much moisture off the shrimp as possible ahead of time. Mine came out perfect, my superbowl party guests devoured this in minutes. I wonder what could have gone wrong for you guys. did you use FF ingredients? as stated above FF ingredients will make it watery. Yes, I'm wondering the same thing. I'd like to prepare it early, refrigerate and then pop in oven. Can you think of any reason it would not work? can I make this exact dish and supplement with chicken (my husband is allergic to shrimp) I like this recipe better than the chicken one with blue cheese…. 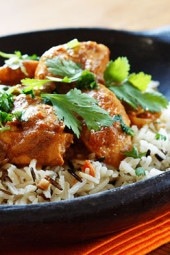 I bought all the stuff today and will be making this and the chicken version for Super Bowl tomorrow! Can't wait to try it. Thank You! 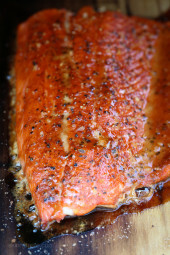 Is this something I could prepare ahead of time and cook tomorrow? Well, I know what I'm making this weekend. Yum! This looks so good. And I bet it would be really good with crab, too. Made tonight as trial run for Super Bowl party. Tastes amazing but dip is real runny. Suggestions? Hmm, and you used cooked shrimp? Mine was also very very soupy. I even let it bake longer. It still tasted delicious and was devoured like a pack of wolves! Made tonight too. Very soupy! Make sure you don't use fat free cream cheese, that will make it soupy. You nailed it with this one! Adding it to my Super Bowl menu!! Oh yummity, yum, yum! I LOVE this idea. I'm in Australia so no Superbowl to watch while eating it. Re-runs of CSI will do won't it? Oh my gosh putting it on a bun with slaw never even crossed my mind! You keep coming up with the good ideas and I'll keep eating. I make my buffalo chicken dip in a glass bowl so I can heat and reheat in the microwave. It takes a lot less time than the oven! Ok WOW. Cannot wait to make this!! Dipping carrots & celery is a great call, too. 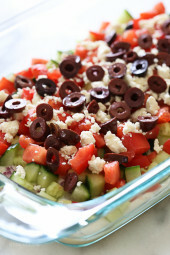 I really like the sound of doing this dip with shrimp! I don't think we have Sargento in Canada. What do I use as a substitute?? Thank you. It's just a brand of cheese, so any reduced fat mexican blend would probably be fine. I just found you're site and I LOVE IT! Had your cajun chicken pasta last night and it was amazing. Filled me up without overloading me with calories. Can't wait to try this and the buffalo cauliflower bites! We will be making both for our Superbowl Sunday! Just have to say – GO NINERS! OMG, I can't stop eating this! It is sooo delicious! This would be excellent as a stuffing in mushrooms! What a fantastic idea! This is a great way to get in that buffalo hot sauce flavor without plowing through a plate of wings. 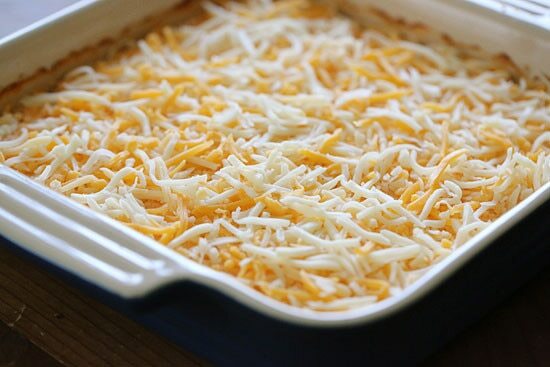 To "ANONYMOUS" from yesterday after 4pm I can't get the reply to open..so here is my question…You put all in the Crock-pot mixed together [good idea, I too hate hard cooked cold cheese on top]…for how long did you cook it on Low?? How come after I read a comment, then hit REPLY, it will not open it up to make a reply?? 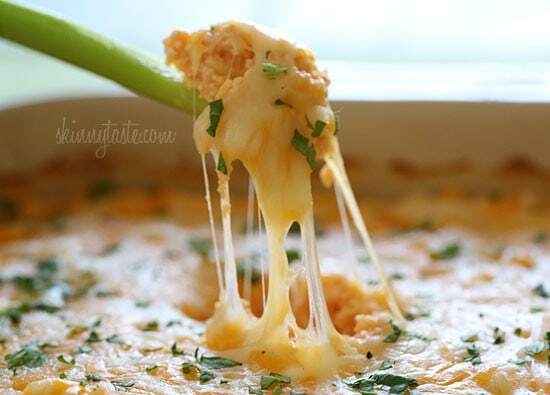 could I make this with blue cheese like in the buffalo chicken dip recipe instead of the mexican blend? I had that last week and it was amazing! Yum! I wonder how it would be with chicken breast instead of shrimp (as my husband is not a fan of shrimp)? Sure, I linked a buffalo chicken dip above, I do it all the time, would be great. Yum you could use crab too. 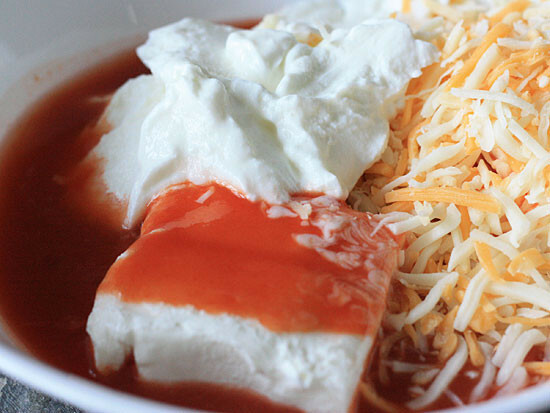 Could I replace the sour cream and plain yogurt with a cup of plain greek yogurt or would that completely change the flavor? I don't know what if would do to the texture. I would like to eat this with a spoon, please. Gina, you complete me 🙂 Thanks for your hard work! How is the shrimp cooked? Or do you by the already cooked ones? Yum! This looks really fantastic! Wow, I am definitely going to make this for Super Bowl! Looks incredible!! What is the green garnish? Cilantro? This one will disappear quick, trust me! You are truly an inspiration. Can we be BFF? WOW!!! I just fainted Gina!!! this look FABULOUS!!! Oh yum!!! Would it be weird if I had this for dinner… the whole thing? OH MY!! that sounds good too!!! Cabbage slaw! Great, now I need to get the stuff to make this. Buffalo. You had me at buffalo. I am so making this for the weekend. Have a party on Sat and Sunday to go to! Thanks! Yum! Wish I had some right now! DROOLING ON MY DESK RIGHT NOW… omg this looks heavenly!